Evans targets a second home win as WRC returns to Wales | News by Wales Express News, People Before Profit! 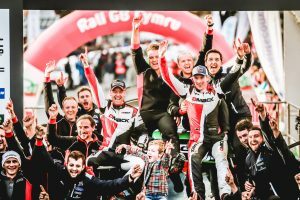 This time 12 months ago, Elfyn Evans was on the verge of making motor sport history. By winning last year’s Dayinsure Wales Rally GB, Evans became not only the first British driver to win Rally GB for nearly 20 years, but also the first Welsh driver ever to win a round of the FIA World Rally Championship. Elfyn Evans celebrates last year’s Dayinsure Wales Rally GB victory. It was a huge result for British motor sport and the biggest ever for Welsh rallying. Understandably, the victory celebrations in Llandudno were special. As well as rewriting the history books, the Welshman’s big breakthrough success also earned him promotion to the main M-Sport Ford factory team for 2018 as team-mate to five-time world champion Sébastien Ogier. It’s fair to say, though, that he has struggled to return to similar highs during what, to date, has been a challenging campaign. “It’s been tough,” he admits, “and pretty frustrating at times. There’s been the odd issue here and there, some punctures and things like that which have cost us the chance of some good results. However, there are still three rounds remaining on the 2018 calendar for Evans to rediscover his winning touch – and where better to start an upswing in results than back in Wales when the WRC returns to these shores in just a couple of weeks’ time (October 4-7). “Competing at home always brings a special motivation,” he smiles. “The fans were amazing last year, seeing so many people out and about was incredible and I hope it’s going to be the same next month. Fans wanting to see if Evans can win again on home soil can take advantage of significantly discounted advance tickets. When purchased now, adult admission starts at just £15 for the Thursday evening curtain-raiser at Tir Prince Raceway with the premium four-day event pass remaining at £99 for the ninth successive year. Day passes in advance for Friday and Saturday cost £28, with Sunday’s Day Pass priced even more attractively at £23. These passes not only give access to all speed tests on that day but also include all booking fees, a copy of the official programme (cover price £9) plus car parking on a ‘first come, first-served’ basis.